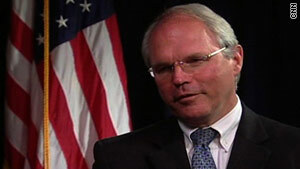 Christopher Hill, the U.S. ambassador to Iraq, says the recent elections were a success. Winner Ayad Allawi: Iraqis "voted against sectarianism"
Baghdad, Iraq (CNN) -- The top U.S. envoy to Iraq said Sunday that the results of the recent Iraqi national election mark a turning point for democracy there, but he warned that challenges remain. Former Prime Minister Ayad Allawi's secular Iraqiya bloc won 91 seats in the 325-member Council of Representatives in the March 7 elections, edging ahead of Prime Minister Nuri al-Maliki's State of Law coalition, which received 89, according to elections officials. Christopher Hill, the U.S. ambassador to Iraq, said the results suggest "there there is democracy in this country." "People have looked at different candidates, and people have gone in different directions," Hill told CNN in an exclusive interview. "And so, I think frankly, it's a good sign that Iraq could have this election." Allawi also acknowledged Sunday the significance of the results, saying Iraqis "voted against sectarianism" when they voted for his secular coalition. "They don't want to see sectarianism prevailing in this country," Allawi told CNN. "They want to have a government that can provide services, can provide security and ensure stability of the country, and improve the income of the Iraqi family." Hill pointed to the challenges Iraqi officials have had to overcome leading up to the elections -- including deadly bombings of government buildings last fall and a delay in passing a key election law. "What is important is that they've gotten this far," Hill said. "When you look at some of the problems [that] have come up in Iraq in the last six months ... a lot of people predicted the Iraqis can't get through that. Indeed they got through ... those challenges and now they have an even bigger challenge, and I would not bet against them." Hill said Allawi's biggest test will be in how he campaigns for more seats to achieve a majority in the Iraqi parliament. Hill said Allawi must be inclusive in assembling supporters and building a government. "If you're the frontrunner -- as Mr. Allawi is right now -- you've got to look out there to other coalitions (and) say how can I put together a government that's going to work?" said Hill, adding "This isn't all about ... who's a Shia or who's a Sunni; it's about who can govern better." Allawi appeared up to the challenge Sunday, saying he wants a "quick formation of a strong government" and one "that can take Iraq forward." "We fought for democracy, and we are continuing to fight for democracy," Allawi said. "That's why we are ready to talk to everyone who is ready to engage and ready to play by the roles of democracy. ... Even if they have been nasty to us and not positive in their dealing with us ... we have an open mind."